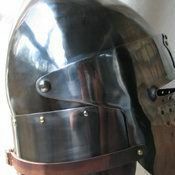 Helmet bascinet with curved visor is typical for the second part of the XIV century. 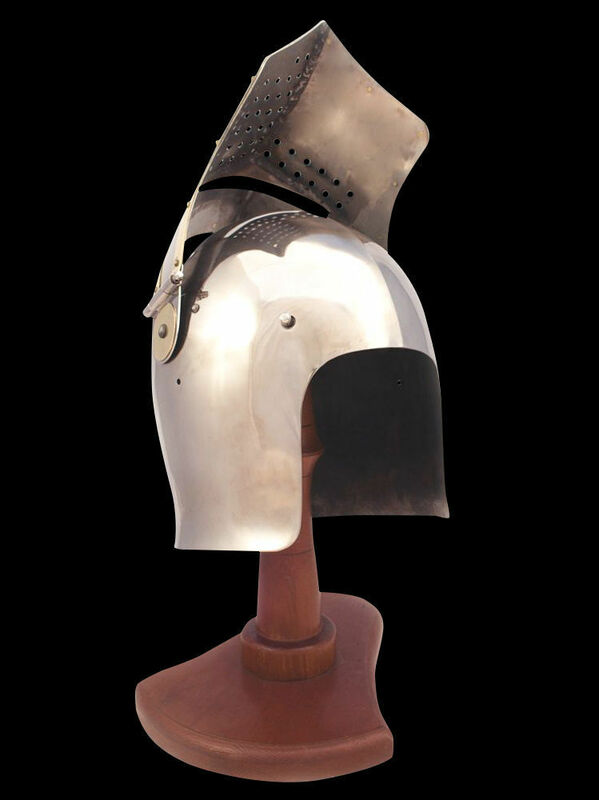 As rich knights, so poor soldiers were using bascinet, as such functional head protection was comfortable in wearing and reliable in battle. 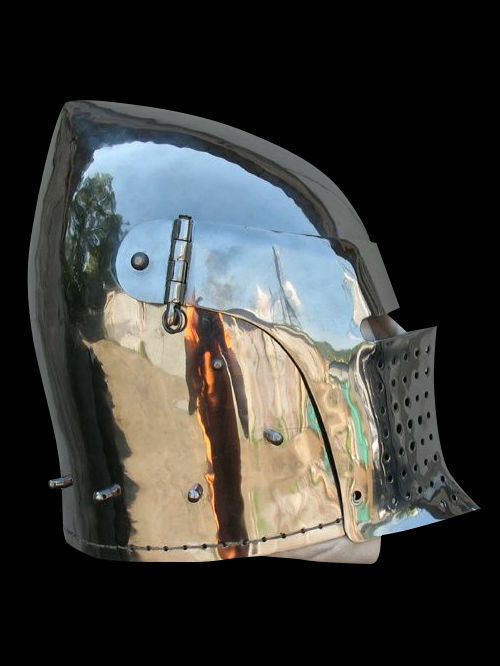 Main advantage of this bascinet is a curved visor, which is not only protect a face, but completely close the chin. For better protection, we recommend to use mail aventail together with this head armor. 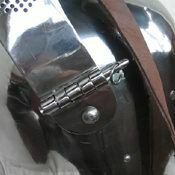 Bascinet is fastened under the chin with leather belt and buckle. Single eye slit and holes on movable visor provide with perfect vision and breathing. 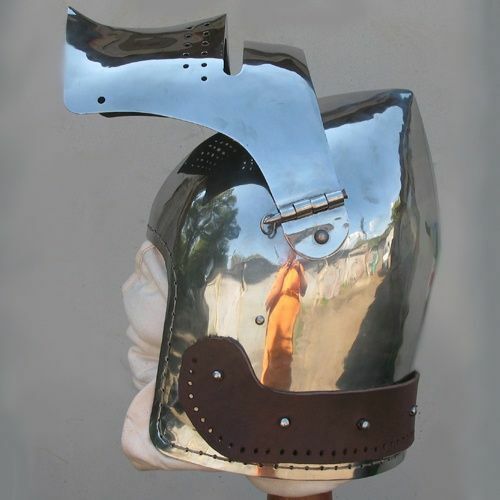 Medieval helm is completely handcrafted by parameters of customer. 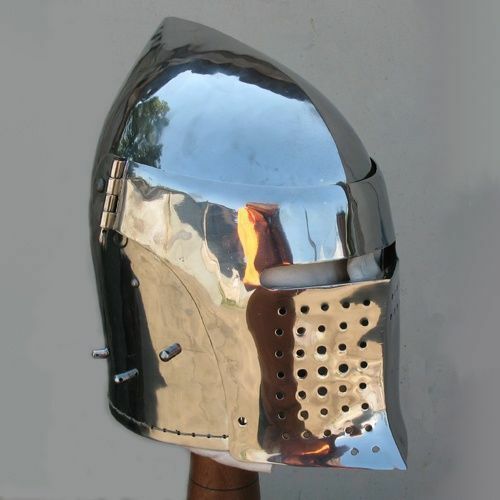 You may also like these models of medieval bascinets: the Italian top pointed bascinet, Bascinet with side hinged bar visor. 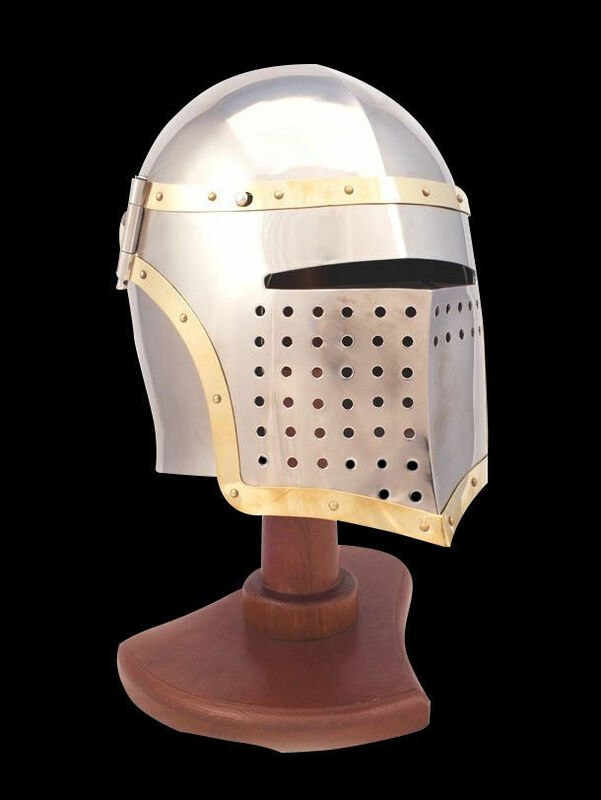 If you want to create medieval helmet by yourself, we offer you to read the article, where we tell how to make such model of bascinet. 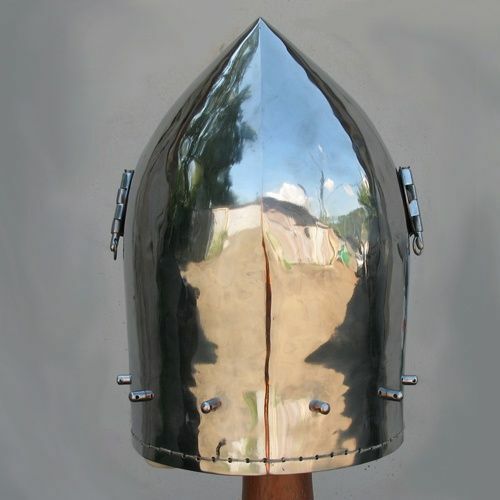 Norman helmet is a type of medieval metal nasal head protection, which was widespread in the Western and Eastern Europe in the X-XIV centuries. Flutes on the dome of this battle helm increase hardness and robustness of armor.  Additionally, we supplied steel helmet with visor. Oculars and holes provide with good vision and free breathing during the battle. You can use this custom handcrafted head protection for: SCA HEMA Larp Stage performances Medieval festivals Reenactment events Main photo shows early medieval helmet with following options: Cold-rolled steel 1.5 mm; Mirror polishing as finish treatment; Brown leather belts; Steel nickel-plated buckles; Steel rivets; No decoration; Sewn liner Base price includes following options: Cold-rolled steel 1.5 mm; Satin polishing; Brown leather belts; Steel nickel-plated buckles; Steel rivets; No decoration; Sewn liner Benefits, which you’ll get, if you buy medieval helmet at Steel Mastery: Custom-made high-q..
Great helm appeared approximately in the end of the XII century in times of Crusades and was in use among cavalrymen until the XIV century. 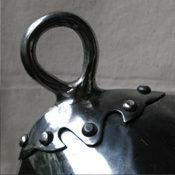 This closed pot helm provides with complete head protection during the combat or bohurt. However, despite of such design, you may breathe free and have a wide arc of vision. 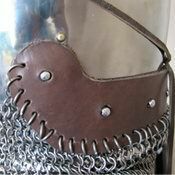 Leather belt with buckle fixes this heaume under the chin. For more comfortable and safe using, we strictly recommend to wear this bucket helmet over the padded liner. Mail coif will be additional protection. 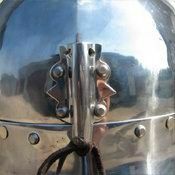 You can use this custom handmade battle helmet for: SCA HEMA Larp Stage performances Medieval festivals Reenactment events Main photo shows early medieval helmet with following options: Cold-rolled steel 1.5 mm; Satin polishing as finish treatment; Black leather belts; Brass buckles; Steel rivets; Brass strip Base price includes following options: Cold-rolled steel 1.5 mm; Satin polishing; Brown leather belts; Steel nickel-plated buckles; Steel rivet..
Japanese helmet kabuto had appeared approximately III-V centuries A.C. As a rule, it has semi-spherical shape of dome with plates for neck protection. Dome consisted of six plates and reinforcing forehead plate. Kabuto was a very important element of medieval Japan armor and resembled status of its owner. 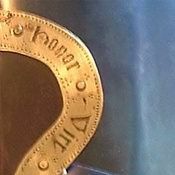 Basically, it was made of six or eight metal or leather plates, riveted together. 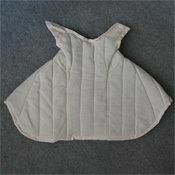 Sikoro (an element of neck protection) was made of incurved metal lacquered plates, linked with silk or leather belts. Originally, Kabuto never had the full protection of face, but could be completed with a mask. This model of Japanese helmet has a bar grid mask. 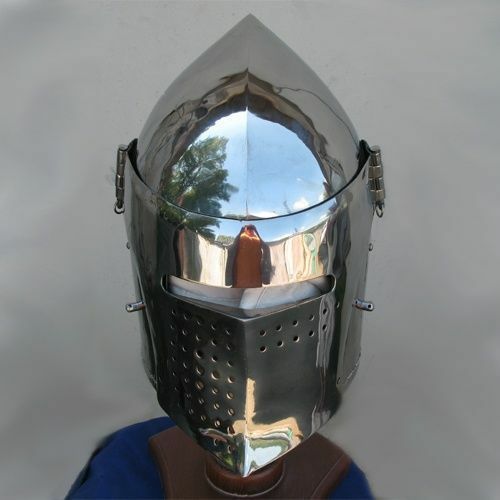 Your face will be completely in safe during medieval fencing and combats, though such mask is not a historically correct. This made-to-measure Asian combat helmet is completely handcrafted by our artisans. You can use this samurai helmet for: SCA HEMA Larp Stage performances Medieval festivals Reenactment events Main photo shows authentic battle helm with following..